Thallium sulfate was employed as a rodent(Rat) killer, Household use this poison has been prohibited in most developed countries. Thallium is mostly used photoelectric cells and Thallium oxide is used to produce special glass with a high index refrection. It is very toxic and there is evidence that the vapour is both teratogenic and carcinogenic. It can affecting the central nervous system of body. It is found in several ores like pyrites, which is used to produce sulphuric acid. 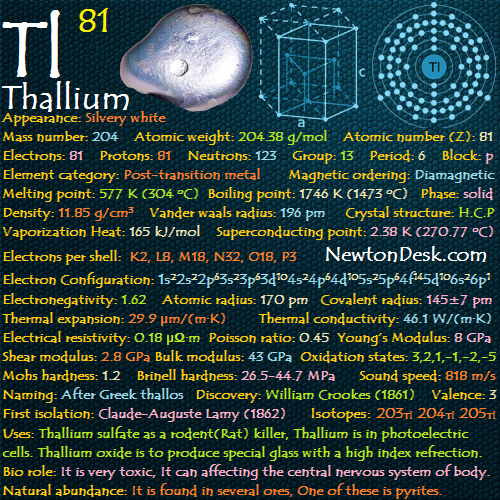 But Thallium is mainly obtained as a by-product of copper, zinc and lead refining. Thallium is also present in manganese nodules found on the ocean floor.